When the Saints go marching in do you want to be in that number? 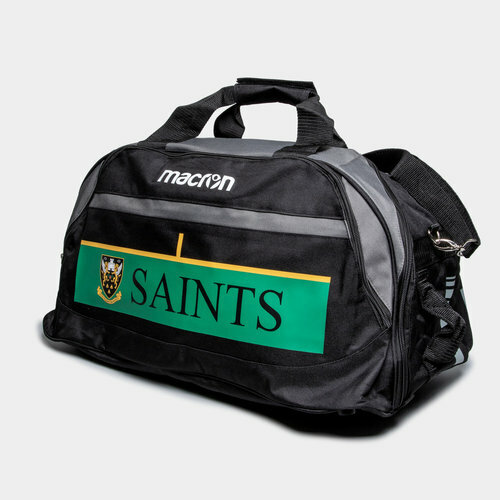 You can do just that in this Northampton Saints 18/19 Players Rugby Gym Holdall from Macron. Northampton Saints of the Gallagher Premiership has won the English Premiership, the RFU Championship three times, the Anglo-Welsh Cup, the EDF Energy Trophy, the European Rugby Champions Cup, and are twice winners of the European Rugby Challenge Cup. They have designed and produced a 2018/19 kit and training range with Italian manufacturers Macron. The kit this season is innovative and modern but maintains the club's heritage of running out in the traditional black, green and gold colourway. This bag is the perfect holdall to take all of your belongings to training and matches in. This holdall has a main large compartment for organising kit and boots as well as a small front pocket for valuables and essentials. To make this bag easier to carry it is two small side handles as well as a longer handle for shoulder carrying. The bag comes in a black and grey colourway with a green and yellow design similar to the team's kit and training attire. The bag has been finished with the macron logo and the Jimmies crest.